"I can't say if I'll ride it. 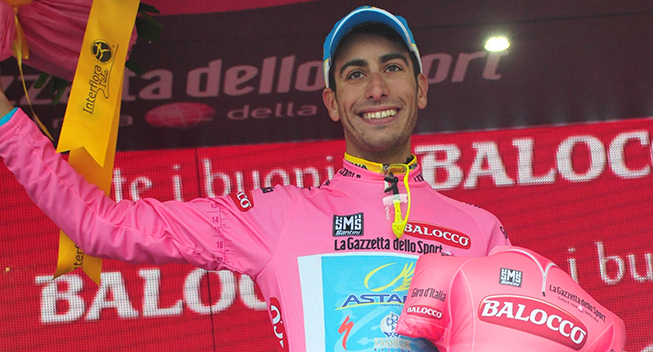 We'll decide our goals and race programs for 2017 at the first Astana get together at the end of November,"
While his DS at Astana said last week that Fabio Aru would definitely be at the start of the 100th Giro, the Sardinian would not confirm yet if he would be at the race. "I can't say if I'll ride it. We'll decide our goals and race programs for 2017 at the first Astana get together at the end of November," he said. Aru says he hopes his recent fame has helped his home of Sardinia host the Giro, something they have only done three other times in 99 Giros. RCS Sport have included both Sicily and Sardinia to try and attract Vincenzo Nibali and Aru, who are natives of each island, to the race for its 10tth edition as they are Italy’s best GC riders. "I hope I've played a part in the Giro d'Italia starting in Sardinia. I'd hoped they'd get the start and it's going to be great for people in Sardinia to see the Giro from the roadside. It's only happened four times in the hundred year history of the race." one thing Aru says will be difficult about this Giro is that there is no easing in, riders must be good for all three weeks rather than coming good for week three, thanks to the presence of the stage four summit atop Mt Etna. "It's not an easy race for sure and will be undecided right to the final time trial. It suits complete riders who can climb and time trial," Aru said. "Whoever wants to win the Giro d'Italia will have to be on form right from the start and right to the end. I know I'll have to work hard to be ready for the time trials too."